No one wants to lose a tooth or multiple teeth. There are many reasons for tooth loss. These reasons include trauma, advanced decay, periodontal disease or lack of formation of a tooth. Options to replace missing teeth include partial or full dentures, fixed bridges or dental implants. All of these options are available in our office. While all three of these options restore aesthetics and some function, only dental implants can preserve bone and also restore full function like a natural tooth. The jaw bone exists to support teeth and when one or more teeth are lost, the bone begins to shrink. This progressive process can lead to sinking of the face, an older appearance to the face, loss of chewing strength and bone loss on surrounding teeth. Our doctors want to provide the best long term solution for tooth replacement and dental implants is this solution! Dental implants trick the body into believing a tooth is still present, so little or no bone loss occurs and the progressive nature of bone loss is stopped. We are happy to provide both the placement and restoration of dental implants in our office. Dr. Jill and Dr. Cara have experience restoring function through dental implants for both single teeth and full mouth restorations. We would love the opportunity to meet with you and discuss the options that best meet your desires and concerns. Please feel free to call our office to set up a complimentary consultation with us by calling 972-347-1145. For further information on dental implants please read below. Dental implants replace the root of the natural tooth. The crown of the natural tooth is replaced by a manufactured crown. The implant and crown are connected by means of an abutment. Together, the implant, abutment, and crown produce a replica of your tooth that looks and functions like a natural tooth. Only when we lose something do we realize its true value. In the same way, we tend to take our teeth for granted until they are lost. The importance of our teeth in day-to-day life becomes painfully clear as soon as they are gone. Your smile is an integral component of your personal identity and part of what makes you recognizable to the people around you. Healthy and beautiful teeth are not only attractive but they radiate vitality, self-confidence, and likeability. Losing your teeth can be painful, uncomfortable, and embarrassing, but you are not alone. Millions of people lose their teeth every year because of trauma, heredity, gum disease (periodontitis), and poor oral hygiene, and millions of people are turning to dental implants as a way to get their quality of life back. With dental implants, your dentist can replace your missing teeth with new durable teeth that look and feel like your own. You will find that restoring your smile will help to bring back your self-confidence when eating, speaking, smiling, and even kissing! When only one tooth is missing, a bridge requires neighboring teeth to be ground down to serve as supporting posts. Removing protective layers of neighboring teeth makes them more prone to decay. Proper hygiene is challenging with a bridge, and as a result, many people experience additional tooth loss. A bridge can turn a one-tooth problem into a three-tooth problem! 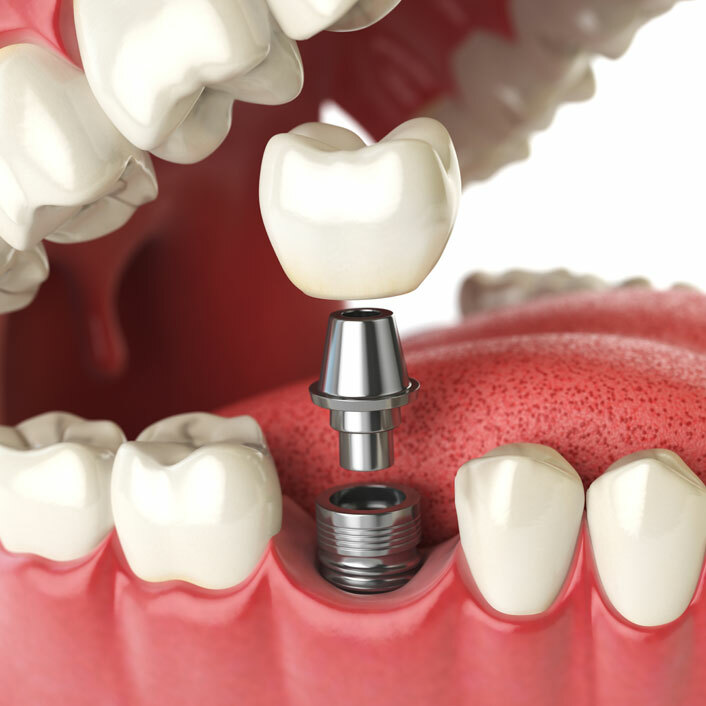 Implants only treat the tooth that is already lost, and therefore, are a one-tooth solution to a one-tooth problem. Partial and full conventional prostheses (dentures) can cause pressure points and impact the ability to taste as well as tactile and temperature perception. Because of bone loss, loose-fitting dentures have to be continually adjusted with frequent office visits. Such problems can be prevented with implants. Unstable prostheses make it difficult to speak, smile, and laugh with confidence, which affects your social life negatively. Implants will securely stabilize your prostheses. When a tooth is lost, the surrounding bone begins to shrink away, thus compromising adjacent teeth and changing the structure of your face. (Figure 2 demonstrates facial changes due to bone loss.) Implants replace the natural tooth root to prevent bone loss, prevent facial changes, and prevent neighboring teeth from being compromised. Although implants may for the short term be more expensive than other forms of tooth replacement, they have a much better long-term prognosis. Over time, selecting implants as your treatment option will be more cost-effective. Implants Promote Overall Health. People with missing teeth have trouble eating certain fruits, vegetables, and meats. Eliminating these items from your diet can lead to poor nutrition, and failure to chew these items properly can lead to digestive problems. It has been clinically shown that people with poor chewing function are on significantly more (17%)* medications for gastrointestinal disorders than those with good chewing function. Implants stabilize your prosthesis to enable good chewing function, allow you to eat a balanced diet, and minimize digestive problems. The image to the left demonstrates ow neighboring teeth are ground down for a 3-unit bridge and how only the lost tooth is treated with an implant. Implants are securely stabilized into your jawbone and are approximately the same length as your natural tooth root. Implants and supported teeth function just as well as your natural teeth. As with any surgical procedure, a full consultation should be carried out before implant placement. Your dentist must first obtain a precise overview of your oral status, your daily habits, and your state of health. A detailed treatment and cost plan will inform you of the treatment phases and the associated costs. Remember that alternative treatments may not last as long and often need to be replaced. When evaluating tooth replacement options, talk to your dentist about expected longevity of each treatment and the potential for additional procedures required for maintenance of each treatment option. Don’t spend more money over time on a treatment that initially seems less expensive.